April is here… April first, April Fools Day, April showers bring May flowers. 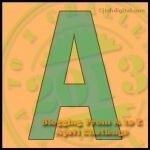 April is also the month of the Blogging from A to Z April Challenge. You may wonder why I would attempt this again this year, especially considering that I only got through the letter “T” last year. Yes, that thought crossed my mind too, but then I thought, “What the heck, its worth another shot.” Plus, even though my alphabet only had twenty letters last year, it was still fun so I decided to do it again. So… for the next month expect to hear from me on an almost daily basis (we get Sundays “off” for good behavior). This morning I flipped the calendar to April and smiled. We made it. March is finally over. I realize that March has 31 days like many other months during the year, but somehow, it manages to feel more like 85 when we’re in it. While I’m gearing up to get outside in the garden, the clouds keep coming through and making deposits of cold, wet white stuff, stalling all of my plans. April, however, is a different story. April brings sunshine, and warmer weather. April brings about new beginnings and new growth. Trees and flowers begin budding so fast you can practically see them growing right before your eyes. Grass starts poking through the melting snow. Seeds start growing and babies are everywhere, especially farm babies. Baby chicks and piglets and ducklings and calves… And every last one of them are so stinkin’ cute I can hardly stand it. April is also the beginning of a new gardening season. I don’t know about you, but in my mind, especially in April, the entire gardening season is perfect. Somehow I’ve forgotten about the 100 year rainfalls and drought of years gone by and only see sunshine and flourishing abundance. And I like that about April. New beginnings. Fresh starts. Clean slates. I’m ready, April. Bring it on! Do you love what you do? Do you do what you love? Do you wake-up excited to start your day? I got a lot of sleep last night. The most I can remember in ages, nearly ten and a half hours, which is unheard of for me, lately anyway. And me feeling rested, really rested, is much like Magda on speed in the movie There’s Something About Mary. In any case, the sleep did me well. And today, I woke up, surfing through my thoughts. Anxious for the chicken coop to be done so that the trio of hens can join us soon. And my next thought was relief. I applied for the Urban Farm Certification Program last week and then I got a response from the program director, letting me know that she received my application. She had a St Louis area code. Uh, oh. Maybe my dream is a pipe dream. I can’t go to St Louis for a year to learn about Urban Farming! But alas, I got another email yesterday which showed two sites that completed the certification last year… in the Twin Cities… Whew! Okay, back on track. So I’ve been thinking. When I started Walnuts n Pears, the blog, it was phase one to my dream business of having everything for living a healthy life, mind, body and soul, all under one roof. And my plan this year was to start teaching some classes, of which I did a handful, but now, I’m thinking maybe this concept could become a reality even sooner. If I take the certification course, if I start teaching classes, if I turn my yard, garden and home into a classroom, then perhaps this thing, this dream, could become a reality. Maybe I could offer the parts and pieces (a small store) to go along with the classes… I’m thinking out loud, or on paper, or well, virtual paper anyway, as a way to get my thoughts out there. As a way to have you and the universe give me a little feedback. Egg|Plant Urban Farm Supply is one of my favorite stores. I love their concept and they are a great resource, but they are in St. Paul. What if there was something similar, yet different, in the Minneapolis side of the world? Would you come? The owners of Egg|Plant are great, I wouldn’t want to hurt their business, I would like to add to it. Feed off each other, maybe? It’s funny, I saw a link on my Facebook page today for Urban Farm Magazine. I love that magazine. I love growing things and I love teaching others how they can do the same. I’m always anxious to learn more. I think if you stop learning, if you think you know it all, then you truly stop living. I hunger for more. I love learning new things, whether it’s better ways to do what I’m already doing or something brand new. So this might be it. The stars just might be aligning. The “What do you want to do when you grow up?” might be coming to fruition. The funny part is, I have never really known what I wanted to do when I grew up. As a child I wanted to be a teacher. I guess that part of me is still there, but just not in the traditional sense. I come from a family of teachers on my Mom’s side. All of my Mom’s sisters either were or are teachers and while my Mom wasn’t a teacher for her career, she’s a tutor now that she’s retired and she absolutely loves it. It makes sense that I too would want to teach, right? But not always, not day in and day out. But occasionally, yes! I have too many other ideas and too much bottled-up creativity that I need to be able to use as well. So what better way than turning Walnuts n Pears into the place I want to go. Walnuts n Pears – Living today for tomorrow’s generation. A place to come, learn and share ideas and resources for today, tomorrow and the days that follow. A little gardening, a little planning, a little planting, a little crafting, a little cooking, a little meditation, a little of this and a little of that, all fun stuff that is centered around living a mindful and sustainable life. Obviously, I have to do a little more in the planning and prep and see what I can and cannot do on my own turf, but what do ya think? Any ideas? Thoughts? Feedback? Pros and cons? Would you come? What would you like to see? What would you like to do? I’m excited about the possibilities. I’d love to hear your thoughts. Here’s to making subconscious dreams come to fruition! The 8 Weeks to a Better You! Challenge ended this past Saturday, October 27th, but I have to say that I learned a lifetime of lessons on this challenge. Challenge Lesson 1: Live mindfully, but keep everything in perspective, don’t lose sight of the bigger picture. Get at least 45 minutes of exercise per day. Exercise is my friend. This challenge, I decided to take it easy on the exercise. I have a tendency to push myself too hard, which usually means injury or burn-out. When I was trying to figure out what I would do for exercise I knew I needed something I could sustain for eight weeks. I thought of the story The Turtle and The Hare. I chose walking. Ironically enough I’ve had two doctors tell me not to run, just walk, I actually listened. I loved it, looked forward to it and missed it when I didn’t do it, just like a friend. Exercise in the morning. I realized that if I don’t exercise in the morning, I usually won’t do it. I learned that I love my morning walks, it wakes me up, fills my lungs with fresh air and lets me sort out my thoughts and plan my day. When I’m done, my mind is clear and I feel good. Not enough sleep is not enough sleep. With eight weeks to practice getting 7 hours of sleep, I paid close attention to what I felt like when I did get enough sleep and the days that I didn’t. And now that I know what it feels like to get at least 7 hours of sleep on a regular basis, I’ve learned that my patience, creativity, understanding and happiness depends greatly upon how much sleep I get. If I don’t get enough I’ll be setting myself up for disaster the next day. Water is key. I’ve always had a tough time drinking enough water in a day, or rather, tracking how much water I drink, but I used a few tricks this time. I have a couple of 16 oz. “beer glasses” at home. I realized that if I drink four of those in a day I’m done. And the nice thing is, most restaurants serve water in the same glasses so whether I’m home or out and about I can still keep tabs on it. The other trick, as crazy as it sounds, is that I like to sip hot water. I grab a coffee mug and sip away just like I would a cup of coffee. If I combine my pint glasses and a couple of cups of hot water throughout my day, I know I’m set. Amazingly, I now rank hydration right up there with sleep. Being hydrated makes me feel fresh and energized. When I get enough water I’m not groggy, my skin looks full (for a lack of a better way to put it) and I feel good. Sugar and white flour are not your friend. Oh, I know they are tempting, trust me. Pre-challenge I had the sweetest of sweet tooths and love bread and pasta. What I’ve learned though, is that when I eat white sugar and white flour I feel hallow. I have cravings that don’t stop, but when I replace white sugar with honey, agave, etc. and replace white flour with whole grain flours or other grain flours I feel satisfied without cravings. I feel in control. Soda, fast food and junk food are poison. I know it sounds extreme. Everyone knows that these things “aren’t healthy”, but we still eat them. I focused a lot of my energy in the past 8 weeks on food and it’s downright appalling that most of the stuff on grocery store shelves is legal much less labeled as “food”. Food is nourishment for your body. The junk that fills the middle of our stores is not food, it does not nourish our bodies and in most cases we can go so far as to say they are toxic. There is study after study that shows that this is the stuff that causes Diabetes, Cancer, Heart Disease, contributes to ADD, ADHD, the list goes on. What’s sad is that so many of us trust that if we find it on our store shelves it is okay to eat. Wrong. Basically it’s there because it won’t kill you, today, but keep eating it day in and day out and you’re just running an experiment, waiting to see which disease you will get. We all have to do our due diligence to read labels. If it has more than 5 ingredients, has “hydrogenated” anything, high-fructose corn syrup or ingredients you can’t pronounce, put it back! If you happen to frequent fast food restaurants, do yourself favor, go online and look up the nutritional information for the things you usually order, if they’re bad, find some alternates and circle them. Keep them in your car so you aren’t tempted to order the bad stuff when you go there. And please, skip the soda, especially diet. Your body and bones will thank you. I love coffee in the morning. The Challenge eliminated coffee. They lumped it in with soda, because of the caffeine, which I personally had issue with because there are so many bad things about soda and no redeeming qualities, but I’ve found more benefits than drawbacks to drinking coffee. In any case I ditched coffee for about 6 of the 8 weeks, that is until I discovered a link to coffee having a calming effect with my personality type, the reverse effect that it has on most people. Like anything though, too much of a good thing is… too much. Going forward I’ll keep it to two cups a day. Fruits and veggies are miracle workers. I mentioned in my previous post, The End of The Challenge: Why You Should Eat Less Meat and More Plants, why plants are good for us. Go there, read the post, watch the movies listed in the post. Not to sound dramatic, but it just might save your life. Vegetarian doesn’t necessarily mean healthy. As I navigated my way through food over the course of the past eight weeks, I started looking into a variety of diets. Not diets in the sense of dieting, but diets in the sense of the way of eating. When I realized I should be eating more plants, I naturally made my next stop at Vegetarian websites, cookbooks and magazines. I found some great new recipes, have since subscribed to Vegetarian Times magazine but soon realized that “vegetarian” doesn’t necessarily mean “healthy” like I thought it did. The vegetarian diet still allows for junk food, processed foods and foods high in fat. So while vegetarian can be better, I still need to make sure it’s healthy. Eating out is a challenge. A couple of weeks ago I went out with a few girlfriends for dinner. I had decided before we got there that I was going to look for the vegetarian items on the menu to make choosing my meal a little easier. Sadly, other than a salad, my options were veggie flat-bread (which was really good) or cream cheese stuffed, deep-fried mushrooms. Tasty? Yes. Healthy? Not by a long-stretch. Menus are gradually changing, restaurants are gradually adding more organic food and healthier options, but we still have a really long way to go. Unfortunately, if we all keep ordering the other stuff, the owners and chefs think that’s what we want. If we want change, we need to request healthier options both in restaurants and in grocery stores. 8pm has become the witching hour. I realize until I did the challenge, how frequently I used to snack after 8pm. Thankfully this challenge taught me to plan better. I try to eat dinner a little earlier, leaving enough time to get a snack in by 8pm which tides me until bedtime. If I find myself getting hungry after 8pm I drink a glass of water or simply head to bed (depending on the time). I realized that often times I would eat when I was up too late. Journaling is cheaper than a therapist. It’s amazing the healing effect that jotting your thoughts on paper can have. Whether its daily frustrations, random thoughts, future plans or what have you, journaling can really help clear your mind so you can continue with your day. Take time to read scripture or something uplifting. So many people I know say they don’t have time to read. I used to be one of those people too, but when I saw “15 minutes” in the rules I thought, “I can squeeze in 15 minutes.” Some days it can feel impossible, but I found if I could squeeze it in the reward is so worth it and often it makes me want to read more. Random Acts of Kindness are addictive and contagious. I love to see people smile. And one of the easiest ways to make someone smile is to be kind to them, but sometimes we can do a million kind things and not even get a glance, or acknowledgement, much less a smile. Sometimes people don’t respond the way we think they should and that’s okay. To truly do an Act of Service or Random Act of Kindness it takes letting go of expectations. Doing it just to do it. Not for recognition, not for reward, not so we can run and tell someone that we did it or so we can get a pat on the back. Simply doing it to be kind to someone else. If we go into it in that manner it will feel good no matter what the response and that feeling is highly addictive. And what’s better is that once you get in the habit of being kind for no reason at all, it becomes easier and easier to do it. And I’ve found, that when you are kind to others, that kindness is returned, not from the same people necessarily, but from others, almost as though kindness is contagious. It keeps spreading until it comes back to you. Karma, I guess you might say. I choose friends over rules. The bond of friendship is far more important than any rule we might put upon ourselves. If I’m offered dessert, thoughtfully made by my Mother, or if a friend asks, on the spur of the moment, if I would like to join her for a cup of coffee at the local coffee shop when I’m not supposed to be drinking coffee, I’ll always answer, yes. There you have it, eight weeks of life lessons packed into three blog posts. Hopefully, despite their lengthiness, you found some value, some tidbit to brighten your day or something to make you think. I wish you a thoughtful, joyful day packed with your own life lessons and healthy habits.